The VW Golf is perhaps one of the most readily recognisable cars on UK roads today. It’s reliable, sleek and a smooth drive. We handle many jobs at White’s Bodyworks and some are more tricky than others. 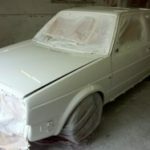 Sometimes, though, customers are simply looking for a good respray or paint job. It’s one of the easiest ways to add new life to an older car, especially one that’s been damaged through rust, dents or scratches. Since it first came onto the market back in 1983, the VW Golf was one of the highest selling vehicles in Europe. In fact, between then and the end of production 1992, some 6.3 million units were sold. 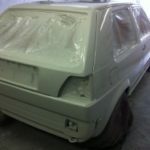 Of course, some people say that it’s not yet old enough to be considered a classic car but we beg to differ at White’s Bodyworks in Sussex. This certainly has all the hallmarks a vintage vehicle needs and we’ve been lucky to do work an a few over the years. The key to repainting any car is taking the appropriate amount of time and paying attention to detail before you get down to the job at hand. When even little things go wrong or the surface isn’t prepared properly, it can show up like the proverbial sore thumb. 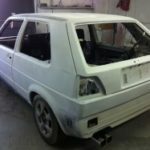 Get it right, though, and you can make a car like the VW Golf Mk 2 seem as if it’s just come off the showroom floor. The good news is that this exactly the sort of thing we excel at!